3M is known to be the innovation company that never stops inventing by turning ideas into profitable products. The company managed to increase its dividend for 61 consecutive years and has paid dividends without interruption for over a century. The stock price reached a peak level in 2018 of $259, which is our current target price based on the free cash flow valuation. 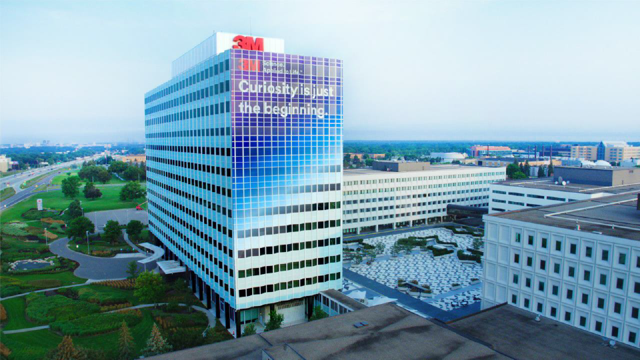 3M Company (MMM) is a diversified technology company operating through five segments: Industrial, Safety and Graphics, Healthcare, Electronics and Energy and Consumer. The company employs 93,516 employees with operations and sales in over 70 countries. By checking 3M's financial report of 2018 and its management guidance for the coming five years, we are able to recommend buying the stock at its current levels with a potential increase of nearly 20% and reaching $258. To justify this recommendation, we will value the company using the Free Cash Flow to the Firm Model and state the assumptions that may lead to achieving this price target. To start our valuation, we will try to project the sales of the company for each segment over the next five years. This growth in sales is based on the average growth for each segment over the past three years. We assume that this rate will be stable over the period of our projection. We will apply the same procedure to get the operating margin of each segment separately. Then, apply the average margin over the next five years to reach a reasonable projected operating income for 3M from 2019 till 2023. The CFO/Operating Income ratio of the company during the last four years used to be between 80% and 92.5%, with an average of 88.53%, and the average increase in capital expenditures was 2.90%. Thus, we will base our assumptions on these figures for the coming years. 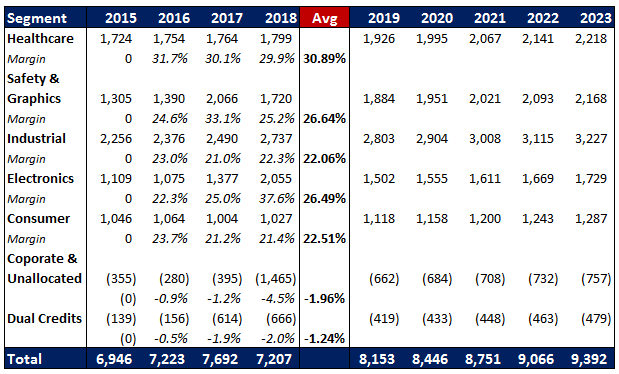 If we compare the figures of our model with what 3M is expecting for 2019 (as indicated in the below table published by the company in its Investor Day presentation), we can see that our operating cash flow is more conservative than management's expectations. To discount the values of our free cash flows, we will have to determine the weighted average cost of capital. We will use the Capital Asset Pricing Model to estimate the cost of equity and the company's current bond portfolio to estimate its cost of debt. Since 3M has five main segments, in order to correctly estimate its business risks, we will determine the unlevered beta of each segment and calculate a weighted beta for the company. Current market cap is approximately $125,211 million, and as of December 2018, the company's debt was $14,231 million. Assuming this capital structure remains the same for the coming years, 3M will be financed 89% through equity and 11% through debt. And by applying the marginal tax rate of 23.4% (as disclosed by the company), we will reach a levered beta for the entire company of 1.05. To have a good estimation of the equity risk premium to be used in calculating the cost of equity, we will divide the revenues of the company across the regions in which it operates and calculate a weighted average equity risk premium. Thus, the Cost of Equity is estimated to be 9.80%. To determine the cost of debt, we will revert to the financial statements of the company and calculate the average interest rate paid on its borrowings, which is 2.40%. However, to be conservative, we will assume that whenever the company needs to raise debt, the cost will be higher, so we are expecting it to be 3% in our valuation. Therefore, the after-tax cost of debt is approximately 2.30% and the weighted average cost of capital is estimated at 9.03%. Terminal value determines the value of any company beyond the projection period in which the cash flows are being estimated (beyond the 5-year period of our analysis). Terminal Growth on company's Free Cash Flow: 3.5%. Based on the above assumptions, the Terminal Value of 3M is expected to be $221,180 million in 2023. By summing the present values of the Free Cash Flows of the coming five years which were previously calculated and the present value of the terminal value, we will reach a fair value for the operating assets of $167,666 million. We now have to account for the non-controlling interest in the company, which has a book value of 52 (as at December 2018). 3M is currently trading at 12 times price-to-book value, which implies that the value of the minority interest is approximately $624 million. By adding the cash value ($2,853 million) and deducting debt value ($14,231 million), we can reach a fair value for 3M equity of $155,664 million. Currently, the company has 602 million shares outstanding (based on the diluted shares calculations), which implies a value of approximately $258 per share. The company's revenues are impacted by changes in worldwide economic conditions, as well as political situations between countries which have direct influence on import and export activities. The risk of change in the company's credit ratings could increase the cost of funding and change the valuation figures. Our valuation for 3M was based on the Free Cash Flow to the Firm Model, which takes into account mainly the capital expenditures and the operating income of the company. Based on this model, the company is currently undervalued with a target price of $258, being a 19% increase from the current stock price levels. This value may be reached in case the above-mentioned assumptions were maintained in the future. While management of 3M clearly stated in the "2018 Investor Presentation" that they are working on improving the company's margins and decreasing it by 2-3% from now to 2023, we did not assume any improvement for these margins in our valuation, which may account for the risks arising in the coming years.